In the wake of the Ashes Tour CHARLIE INGLEFIELD dissects what was, what could have been and what will be for England's Cricket team. 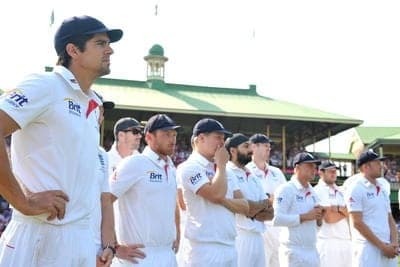 AS England’s cricket hierarchy sift through the wreckage of what has been a disastrous Ashes tour, there will be many difficult questions to act upon. On the top of the pile will be Alistair Cook’s captaincy, Kevin Pietersen’s desire to carry on, and even the futures of the untouchables in the team – Jimmy Anderson and Ian Bell – from a few months before. There is a school of thought to say in 2015 which is when Australia come over to England to defend the urn will come around very quickly and those mentioned above will want to restore pride on home soil. However as Andy Flower said in the Sydney post-match press conference, England has been on the decline for the last 12 months and there has to be some kind of shake-up. The one bonus for England on this trip has been the form of Ben Stokes (honourable mention to Stuart Broad). He performed heroically with both bat and ball whilst his more experienced colleagues collapsed all around him. England have been looking for an all-rounder since Freddy Flintoff retired and now they have one. Stokes could be exceptional, particularly given he will probably never experience the kind of carnage and hostile intensity from this Ashes series. England need to form a team around Stokes and that is where these tough selection posers will occur when working out what to do with the likes of Pietersen, Bell, Anderson and Prior. As bad as England have been in this Ashes and they really have surpassed the many disasters we saw through the 90’s, we have to give all the credit to Australia. Michael Clarke and ‘Boof’ Lehman have been the instigators of England’s demise. They have both created an environment which was previously strained to say the least under Mickey Arthur and have allowed mavericks like Shane Watson and Dave Warner to express themselves. The way their bowling attack tore through England’s batsmen, praying on and destroying techniques and souls was utter cricketing perfection. Combining the frightening pace of Mitchell Johnson with the brisk and wily seam bowling of Ryan Harris and Peter Siddle sent reminders to everyone of when Glen McGrath, Jason Gillespie and Brett Lee were in their prime. I wouldn’t say Nathan Lyon was in the same class as Warney but what a job he did again against England and Lyon will only get better. As we dissect through this series, there were of course crucial points throughout which turned to Australia’s advantage and ultimately, dominance. My man of series would undoubtedly be Brad Haddin. How many times did we see Haddin come in when Australia were five down for not very much and in true Adam Gilchrist style take the game away from England. As well as Mitchell Johnson has bowled and he was exceptional, he was allowed to bowl with little pressure and with a ton of runs as a back-up thanks in part to the counter attacking expertise of Haddin. The cricketing world had not seen this from Australia since those heady days of the early to mid-2000s when the likes of Gilchrist and Warne would counter attack thrillingly from a position of collapse to a match winning total. To put this into further perspective there were two key points in this series where the balance of power shifted. The first was Jonathan Trott’s dismissal in England’s first innings at the Gabba. Mitchell Johnson had gone for 36 from his first six overs and England were going well at 55-1 in response to Australia’s competitive but not insurmountable total of 295. With that wicket Johnson’s confidence soared and the rest is history, as they say. The second was Michael Carberry’s drop at gully when Haddin was seven in Australia’s first innings in Adelaide. It is unfair to put all the criticism on Carberry but that simple miss would have been massively deflating for an England team who had bowled very well on a decent batting wicket on a first day of a test match, just before the close. Haddin went on to make a 100 and England were beaten, there and then. The one percenters went Australia’s way and they charged through England with clinical precision and aggressive intensity. I don’t think England gave up in Sydney as that is a massive statement to make (from some rightly disgruntled fans and pundits alike) without realizing the mental fragility of England’s players going into the final game. Any team would be struggling having taken four successive thumpings to a rampant Australian outfit. England had the Aussies in relative trouble again in the first innings but yet again did not take advantage. What was disappointing was that the batting unit never looked like putting up a decent fight. Bell, Cook and Pietersen looked spent and they are the ones who perhaps need to think about their futures more than the others. England needs to look at their preparation leading into this series. Was Jonathan Trott well enough to come out on tour given the sad illness he has had to battle over the last few years? I also think that Graeme Swann should never have retired half way through the series, no matter how much his game was struggling. I think ‘Swanny’ is and has been a great character as well as player for England but his announcement would have massively disrupted Alistair Cook and Andy Flower’s plans for the remainder of the tour. The last word should go to Australia. It is dangerous to compare cricketing eras especially when examining the excellence of the Steve Waugh and Ricky Ponting teams. However, when watching Haddin bat it was like seeing Gilchrist in his pomp, likewise with Mitchell Johnson when McGrath and Lee were at their best. Warner reminds me of when Matty Hayden used to strut to the crease, chest puffed out like a blindside flanker and knocking the opening bowlers back over their heads at leisure. If Australia march through South Africa and 2014 victorious then Michael Clarke’s men deserve their own place of history and not a comparison to previous eras. As for England, well they need to rebuild fast otherwise it may be a fair few years before they get their hands on the little urn again.